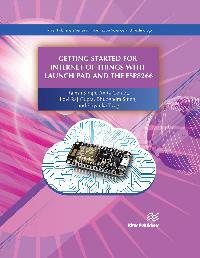 Getting Started for Internet of Things with Launch Pad and ESP8266 provides a platform to get started with the Ti launch pad and IoT modules for Internet of Things applications. The book provides the basic knowledge of Ti launch Pad and ESP8266 based customized modules with their interfacing, along with the programming. The book discusses the application of Internet of Things in different areas. Several examples for rapid prototyping are included, this to make the readers understand the concept of IoT. The book comprises of twenty-seven chapters, which are divided into four sections and which focus on the design of various independent prototypes. Section-A gives a brief introduction to Ti launch pad (MSP430) and Internet of Things platforms like GPRS, NodeMCU and NuttyFi (ESP8266 customized board), and it shows steps to program these boards. Examples on how to interface these boards with display units, analog sensors, digital sensors and actuators are also included, this to make reader comfortable with the platforms. Section-B discusses the communication modes to relay the data like serial out, PWM and I2C. Section-C explores the IoT data loggers and shows certain steps to design and interact with the servers. Section-D includes few IoT based case studies in various fields. This book is based on the practical experience of the authors while undergoing projects with students and partners from various industries.